Traditional Sicilian Cuisine You Shouldn’t Miss Out On! The beautiful Mediterranean island of Sicily has a distinct cuisine that’s steeped in history. 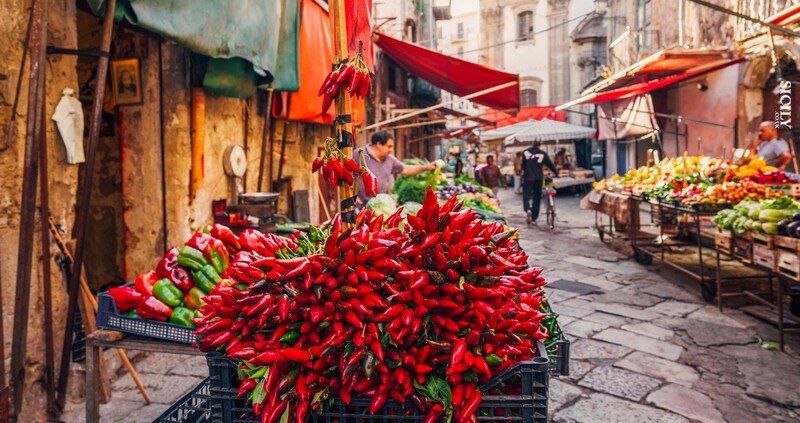 Thanks to influxes of different nationalities over many centuries, traditional Sicilian cuisine is a fusion influenced by French, Arabic and North African settlers. The island itself is incredibly fertile and the produce grown on Sicily includes olives, oranges, lemons, eggplants, tomatoes, pistachios, almonds, grapes, and so much more—not to mention all of the wonderful seafood fished freshly right off the coast. The result? 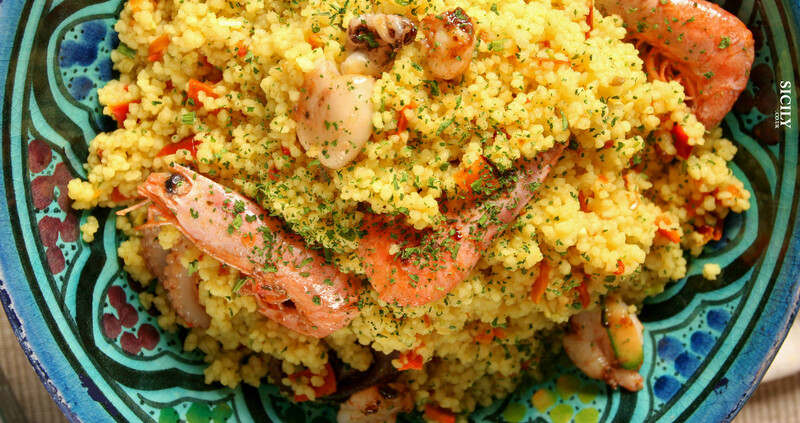 Traditional Sicilian cuisine that’s fresh, varied, and absolutely delicious! So, if you’re lucky enough to visit Sicily, here are a few things you have to try before you leave! This dish comes in many forms depending where you are on the island. If you find risotto on the menu in Sicily, it’ll always be a seafood risotto. However, the main use of rice is in arancini; rice balls that are a staple across the island. 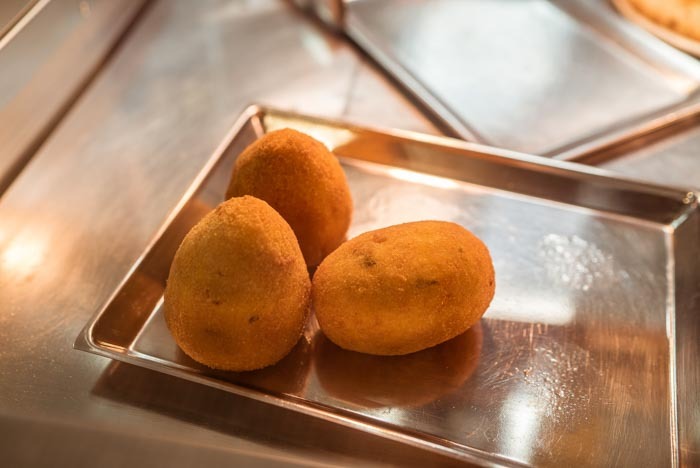 Bite into one of these fried rice balls in Catania, arancini will be filled with ragu, peas and mozzarella, but if you go to the centre of the island, it will be filled with chicken liver. In the south east of the island, in Syracuse, the rice isn’t cooked with saffron but with tomato and mozzarella. It’s a constantly changing but delicious dish that depends heavily on the fresh ingredients available. This is a typical dish found in Palermo. It’s real ‘street food’ served in markets, eaten out of paper – just as we do with our fish & chips, the Sicilians have been doing it for thousands of years! The name of this street food means, literally, “bread with spleen”! But don’t let that put you off. 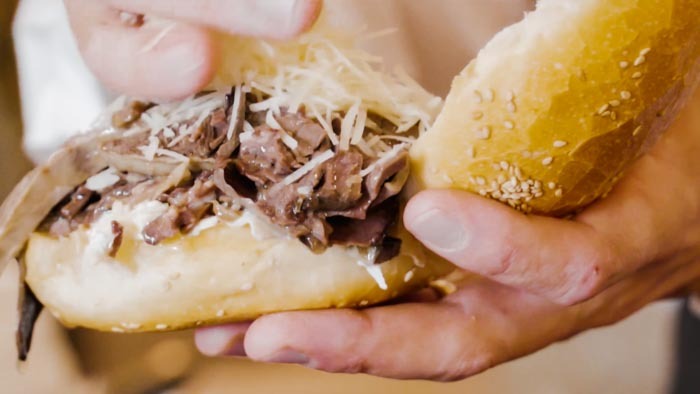 This fast food is a sandwich of pork spleen, which is boiled, cooked in lard for a long time and served in sesame flavoured brioche-style rolls. There’s a big food scene on the Sicilian streets, it’s been a part of the culture for a long time but is now viewed as fashionable too! 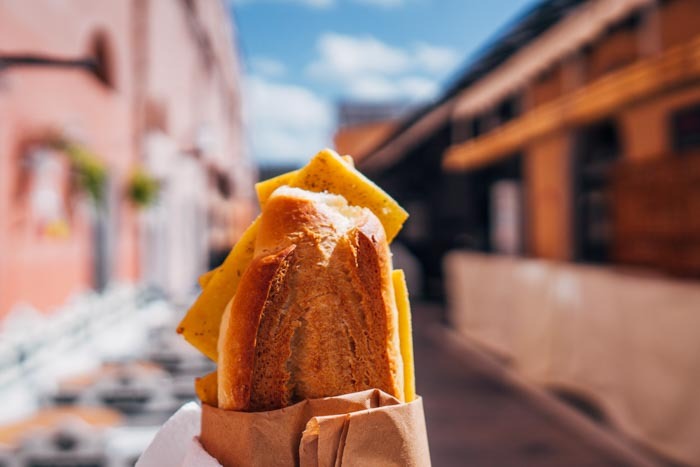 Another favourite is Pane e pannelle: a favourite street food of Palermo, pannelle—or chickpea fritters—are served between bread, like a sandwich. 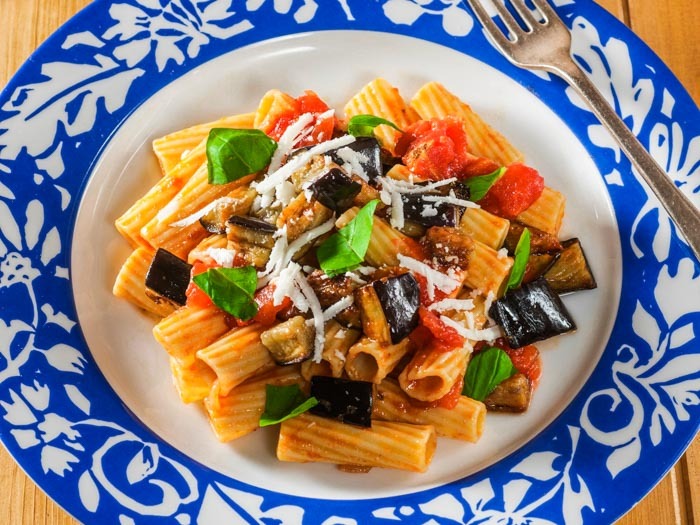 A very popular Catania side of the island dish and certainly something to sing about; this is a wonderful combination of eggplant, tomato sauce and salted ricotta, served with short pasta and is named after an opera written by Puccini. With fresh sardines in abundance, these are very popular in Sicily, so it’s common to see them as a topping for pasta. 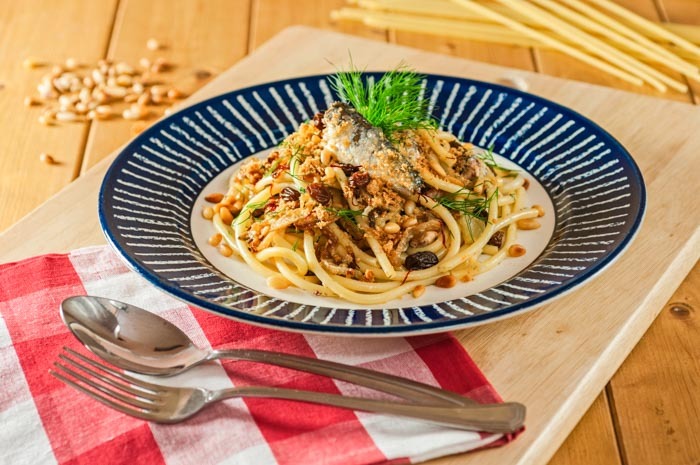 This is a typical dish of the Palermo side of the island and is pasta cooked with sardines, which are the local catch, white fennel, pine kernels and sultanas, served with long pasta like spaghetti or bucatini. It’s delicious! Like many Sicilian dishes, this one is based on eggplant. Eggplants are chopped and fried, and then seasoned with sweet balsamic vinegar, capers, and often pine nuts and raisins. The result is a sweet-and-sour warm salad. It makes a delicious accompaniment to a meal or as a main itself. 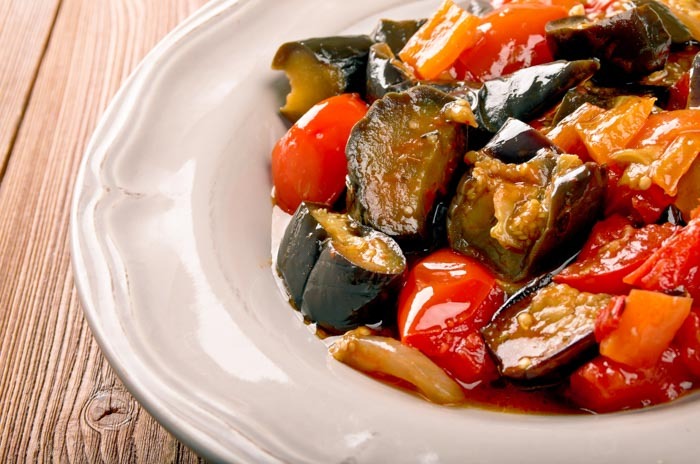 There are about 10 different kinds of caponata and every one has a different recipe using the vegetables that are available. Seafood is a major speciality in Sicily—even sea urchins! This spaghetti dish is very simple, but it takes a long time to make. The chef cuts the sea urchins in half (avoiding the spines) and scoops out the ‘good’ part of the meat, discarding the rest. 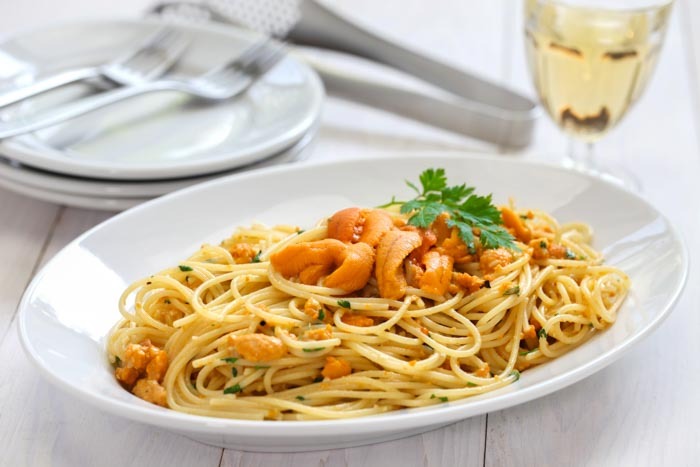 The meat flavours the spaghetti with a delicate, slightly salty taste. It is quite an expensive dish, but that’s because it takes about 15 sea urchins for one portion of pasta. What’s not to love about this typical Sicilian treat? 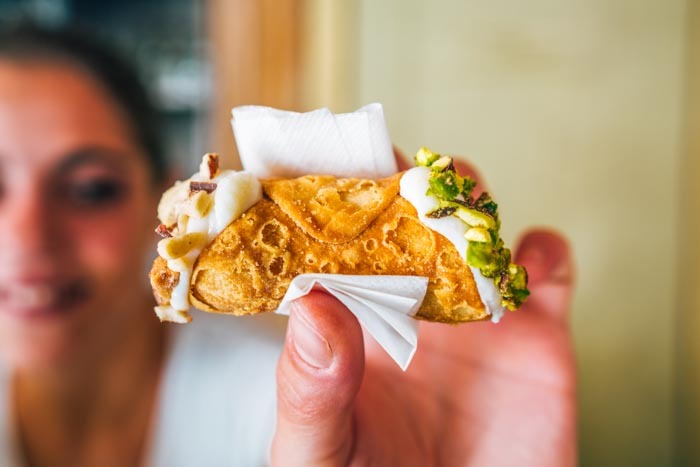 It is probably the best-known Sicilian pastry; a tube of fried dough gets filled with sweetened ricotta—and often topped off with candied fruit, pistachios, or chocolate chips! 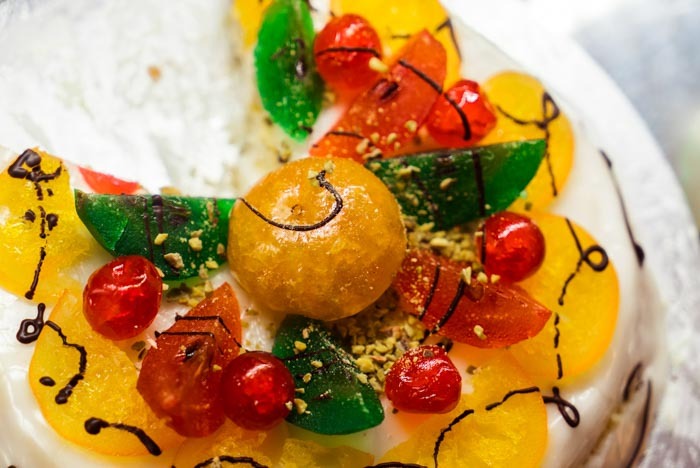 This is one of the sweetest Sicilian desserts you can get; a sponge cake is soaked in liqueur, its slices layered with sweetened ricotta, and the whole thing is covered in almond paste, then icing. Then it is decorated with candied fruits and other goodies just in case it’s not already sweet enough! The perfect summer refreshment; granita, originally from Sicily, is now so popular it can now be found all over Italy. Sicily has very high mountains, so in the past ice was cut from the top and brought down into towns and villages to be made into crushed, flavoured granita. Flavours include almond, coffee, lemon and watermelon. It’s not a slush – you have to eat it with a spoon and it’s always made with the freshest ingredients. In Palermo, one of the best friggitorie (fried food shops) is I Couching, which sells arancini (rice balls), timballini di pasta (deep-fried pasta), pasticcino (a sweet pastry filled with mince) and sfinciuni, a soft flat bread topped with tomatoes, onion, anchovies, cheese, toasted breadcrumbs and oregano. Da Vittorio Ristorante, is a fish restaurant on the beach in Porto Palo di Menfi. There’s no menu, but the antipasti might just include red prawns, octopus in oil and lemon juice or marinated anchovies – whatever the fishermen have caught that day! 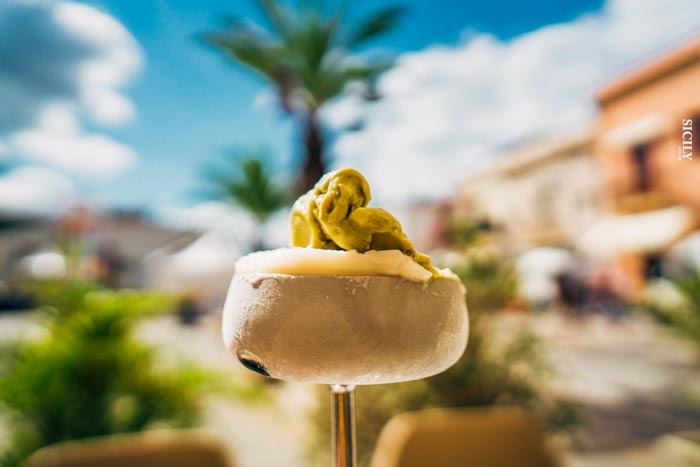 In Modica, La Locanda del Colonello does elegant versions of street food as a starter and main courses such as pork fillet in a chicory and pine-nut sauce, or amberjack in a tomato sauce with capers and oregano. Next to the fish market in Catania is Osteria Antica Marina, named after the arches of a 19th-century viaduct nearby. It does only fish and seafood: fried calamari, mussels or octopus salad as a starter, then fish soup, spaghetti in cuttlefish ink, seafood risotto or grilled lobster to follow. All delicious. Just off of Sicily’s north-eastern coast Lipari (Lipari Town), Vulcano, Salina, Panarea, Stromboli, Filicudi and Alicudi make up the magical Aeolian Islands of Sicily. This little piece of paradise offers something for everyone; swimmers, divers and sailors can all enjoy the clear cobalt blue waters, whilst land lovers can trek through the stunning scenery and grumbling volcanoes. 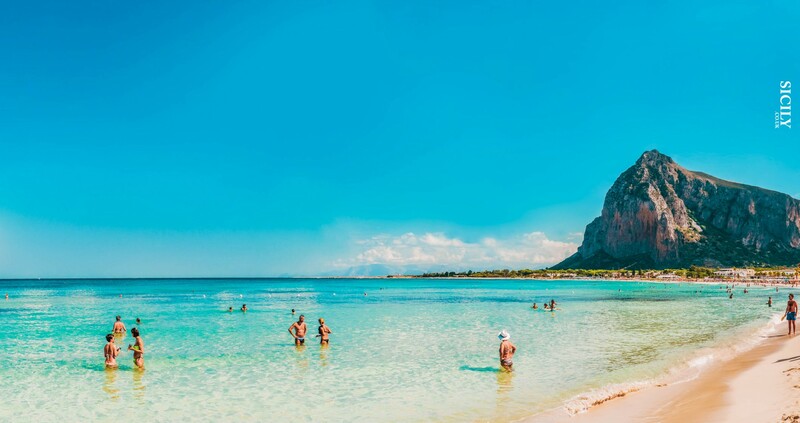 Sicily’s 1,000kms of coastline has something for everyone, from golden sandy beaches, pebble coves, unspoilt nature reserves and vibrant seaside resorts. Palermo’s historical ties with the Arab world and its proximity to North Africa are heavily reflected in the noisy street life of the city’s ancient centre and nowhere is this more evident than in the markets.